David Rio Commemorative Tins are a great way to display the David Rio brand in cafes or for use at home. 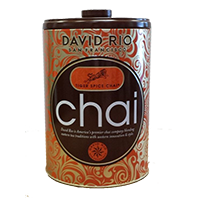 Stylish and airtight they hold a full 4 pound bag of David Rio chai. For every tin sold David Rio will donate $2 to the International Fund for Animal Welfare’s (IFAW) tiger welfare initiatives. Tin only. This product does not contain chai.